PCSIR Laboratories Hyderabad is a multidisciplinary unit located in the heart of three Industrial zones i.e. Nooriabad Hyderabad and Kotri as well as Rural Areas of Sindh and Enjoys a Pivotal Position among the R&D Institutions of this region. Therefore trying its level best to play vital role in sustainable growth of the region by focusing on various dimensions of Rural Development Technology like value addition in Agro Produces, Solar Oriented Techniques for Safe Drinking Water, Drying & Cooking of Food Stuff and Technical Support of Regional Cottage Industries as well as actively providing its Technical Services for Quality Assurance & Control in this Region. 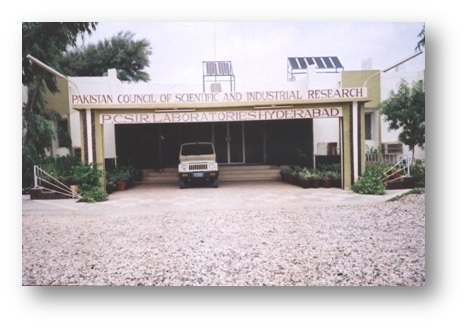 This unit was founded as Solar Energy Research Centre in 1985 and in 2003 keeping in view the needs of this region the scope of was broaden from mono-disciplinary to multidisciplinary. PCSIR Laboratories Hyderabad in addition to R&D Work, completed several adhoc Project and provides Analytical, Consultancy and Troubleshooting Services to Private and Public Sector Organizations and Industries. Students of Universities complete their Internship Training under the supervision of Engineers and Scientists of these laboratories.